Over the past few days we've been busy, busy 'processing' our meat chickens, making jam, hanging laundry, baking zucchini bread and all that good country life stuff. I've also had another visit with the dreaded dentist. Ug! While sitting in that blasted chair waiting for the sedation to take effect the dentist came in and said, "Your blood pressure is a little high. Are you nervous?" Call me crazy but if someone is so afraid you'll kill them with your toothy tinkering tools that they need to be sedated... yeah, they might be a tad nervous. 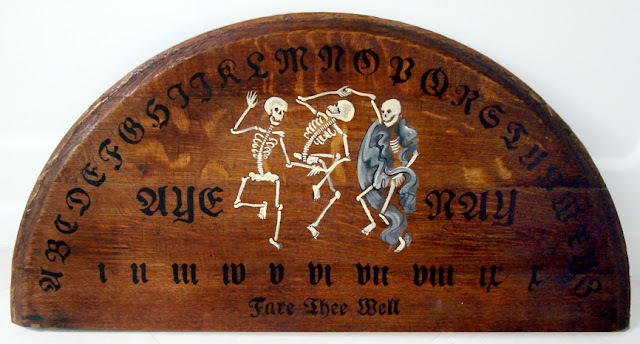 Anywho, here's my latest slightly spooky skelly spirit board now listed in my etsy shop.